Home » Use of Bell Curve in Performance Appraisals – Good or Bad? » Blog » Use of Bell Curve in Performance Appraisals – Good or Bad? Before you’re stuck in the science behind the Bell Curve performance appraisal, do you really think it is fair to categorize your employees in different boxes designated as ‘top performers’, ‘average performers’ and ‘low-performers’! May or may not. Well, we can help you make a perfect decision on this! Read on. If this is all that you wish to do, Bell Curve is the right thing on your mind. Now think for a moment! How cool does it sound when HR people embrace a trigonometric plot (Bell Curve Distribution) calling it to be their strategic distribution of evaluating employee performance? Believe it or not! People in past have used Bell Curve distribution for carrying out appraisal process brilliantly. To an extent, it is all about enforcing the accountability on the employees and expecting them to do better and better. The normal distribution of this systematic bell-shaped graph places the majority of people in the average performance area while keeping the exceptions on both sides of the dropping slope. A lot of debating has happened over the forced ranking system of appraisal. It is now very clear in the minds of HR managers that ‘though bell curve for performance review is the right tool to understand and implement evaluations, yet it is not an ideal outlook for people to think, expect and perform’. 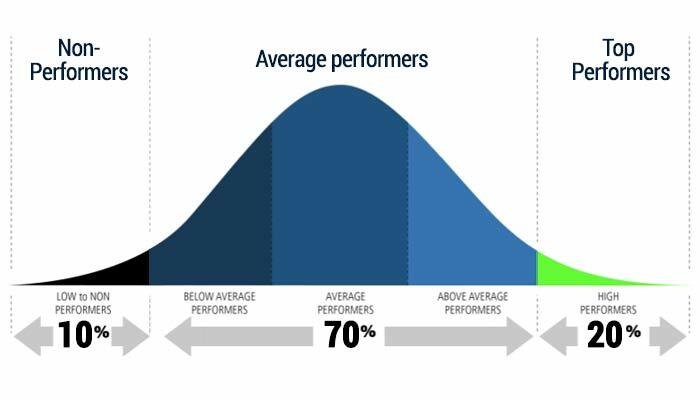 Some HR professionals believe that while carrying out the performance management process, a bell curve graph is the best way to identify the top performers and under-performers, whereas others believe it compels the appraiser to use a forced rating instead of a fair one. However, the truth lies somewhere in between. Let us explore some advantages and disadvantages of using a bell curve for appraisal from the organizational perspective. The forced ranking compels managers to make decisions and differentiate between different employees. Those who are identified as high-top performers are rewarded: they feel motivated and work harder to grow in the company. Their growth and career plans can be developed suitably, and initiatives taken to retain them within the company. This not only helps retain the top talent but also builds succession pipelines. The bell curve is perhaps the only method that can be used by the organization to manage leniency and strictness of managers’ ratings. Lenient scores mean a larger cluster of employees in a high-rating group (a right-skewed bell-curve), and strict scores mean large numbers of employees in a low-rating group (a left-skewed bell curve). These unbalanced scoring may demotivate high performers and retain mediocre employees. The average manager tends to rate on a lenient scale. The training management talks about the importance of the correct allocation of training to employees. The bell curve graph can help identify the training that is most applicable to different categories of employees. Using the bell curve model in performance management may be considered a rigid approach for rating employees. Sometimes managers need to put employees in specific gradients just for the sake of bell curve requirements. This happens more often when the manager’s teams are small. The bell curve appraisal creates doubts in the mind of both managers and employees, who may worry about the possibility of an exit during tough job market conditions. This may lead to a loss of morale and further deterioration of job performance. While there is an ongoing debate on the bell curve based normalization methodology, an additional 360 feedback may help ease some of these doubts. Employees’ desired and actual performance can be viewed through a bell curve in Empxtrack’s Appraisal dashboards. The bell curve can be normalized or used to view the performance gaps of employees.